More than a fifth of the nation's rural hospitals are near insolvency, according to a new report. Twenty-one percent of rural hospitals are at high risk of closing, according to Navigant's analysis of CMS data on 2,045 rural hospitals. That equates to 430 hospitals across 43 states that employ about 150,000 people and generate about $21.2 billion in total patient revenue a year. As rural populations decline, inpatient admissions fall, more beds sit vacant, and the number of people covered by government-sponsored plans rises, these communities are left to grapple with the ramifications of losing a hospital, said Dr. Daniel DeBehnke, a Navigant managing director, co-author of the report and former CEO of the Omaha-based Nebraska Medicine system. "There is a snowball effect that drives a lack of capital, which causes an inability to invest in everything from technology to electronic health records to imaging to keep up with the standard of care," he said. "Looking at the 430 hospitals at risk, that number is significant." Researchers used a benchmark of an average 1.4% operating margin over the past three years, 78.5 days cash on hand and 49.8% debt-to-capitalization ratio to determine financial viability. They also broke the impact down by state, revealing that half of Alabama's rural hospitals are in financial distress, the highest percentage in the country. At least 36% of the hospitals in Alaska, Arkansas, Georgia, Maine and Mississippi are in financial jeopardy. "It's probably the most fragile of situations I have seen in my 23 years at the association," Danne Howard, chief policy officer at the Alabama Hospital Association, told Modern Healthcare in November. A loss of acute-care beds and ultimately hospitals is inevitable, experts said. This though, begs the thorny question: How many hospitals does the U.S. healthcare system need? Navigant set out to define "essential" by weighing trauma status, proportion of Medicaid days or uncompensated care to net revenue, geographic isolation, and hospital employee-to-county population. More than a third, or 153, of the 430 financially unstable hospitals are not "essential," according to Navigant's data. This is not to say these hospitals aren't important to their communities, DeBehnke said. While these metrics provide some clarity, there is no objective definition of an "essential" provider, said Christina Campos, administrator of Guadalupe County Hospital, an independent hospital in rural New Mexico. "The contraction of hospitals may be inevitable as some hospitals merge to reduce overhead costs and as others restructure to focus on outpatient and preventive services, thus redefining themselves," she said. "Try telling any community, no matter how large or small, that its hospital is not 'essential.' "
Neighboring hospitals may find that it's better to work together and specialize in different services by dividing inpatient and outpatient treatment, for instance, Campos added. Hospitals may choose to resize or restructure to reduce their inpatient footprint, like Guadalupe County Hospital did, which typically requires new grants or loans, or a reverse Hill-Burton financing program for improved healthcare infrastructure, she said. Passing the bipartisan Rural Emergency Acute Care Hospital Act would help, Navigant said. It would create a new Medicare classification that would allow rural hospitals to offer emergency and outpatient services but no longer have inpatient beds. Policy experts have also urged an overhaul of the Medicare wage index. "We want to improve quality and population health and reduce unnecessary admissions and waste, but still don't get paid for it, at least not enough to break even," said Campos, adding that rural hospitals' bare-bones budgets and low staffing levels are further stretched by continued legislative and regulatory Medicare cuts. 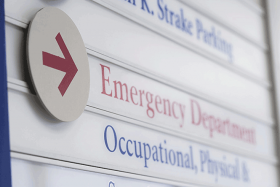 "The greatest financial burden to many rural hospitals is supporting a 24/7 emergency department, where standby staffing costs are high, volumes are relatively low and reimbursement comes nowhere near to covering expenses." Telehealth is an important tool that can help rural providers maintain certain services, industry observers said. But broadband internet access and the current reimbursement model set limitations. Many large systems support community hospitals that can share some of the lower-acuity workload, evidenced by systems like the University of Alabama at Birmingham that are taking on administrative tasks and sharing specialists with their rural neighbors. This can often be more effective than an acquisition, DeBehnke said. When DeBehnke was at Nebraska Medicine, he convened a rural hospital consortium. They shared best practices, revealed each facility's challenges and opportunities, and discussed how to streamline redundant services, he said. "The most significant impact was technology and clinical service development," DeBehnke said. Telemedicine applications for stroke and transplant treatment, for instance, kept services in the local communities and maintained care in the appropriate settings, he said. Sharing an EHR platform unburdened local facilities and improved care continuity. And sending specialists from the system to rural hospitals once a week or every other week helped mitigate recruitment issues, DeBehnke said. Hospitals should create a community health needs assessment that uses data to separate wants from needs, Campos said. But ultimately, changes to services, telemedicine or referral networks require improved EHR interoperability, broadband investment and policy tweaks to bolster reimbursement and encourage clinical integration and data-sharing, she said. Hospitals need to recognize they can't provide every service under one roof, Campos said. An ability to provide safe and high-quality care is of utmost importance, she said. "Poor care and negative outcomes are more detrimental to the survival of a rural hospital than is poor reimbursement," Campos said. "If your reputation is lacking, your community will no longer support you, and a rural hospital cannot survive without the overwhelming support of its community." There is going to be some degree of right-sizing for U.S. hospitals, DeBehnke said. "We hope this report shines some light on the issue as we figure out how to do this in the right way," he said.